Last month, I saw Monterrey-based duo Clubz play in the early afternoon at Ceremonia Festival in Toluca, Mexico. 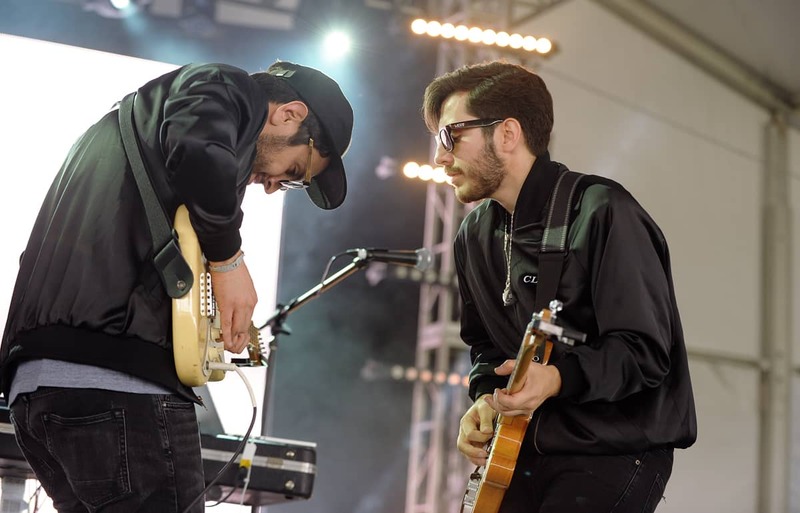 On stage, Coco Santos and Orlando Fernandez wore personalized bomber jackets and dark sunglasses, both played guitar (sometimes the same riffs) and often sang in unison on top of loud, upbeat drum machine loops. The result was crisp, Spanish-language power pop that—as I mentioned in my festival report—exists in that foggy, tough-to-classify sweet spot between sunny and melancholic. They were playing selections from their catchy, '80s-indebted debut EP, Texturas, as well as new, unreleased tunes from its follow-up, which is in talks to be released by Madrid-based audiovisual production company CANADA. Later that day, I sat with Santos and Fernandez by some picnic tables in the middle of the festival grounds. The sun had just set, and the temperature had instantly plummeted like, thirty degrees. During our short talk—which was amicably interrupted twice by young fans who wanted to snap a photo with them—the duo spoke about hunting for vintage synths, the sometimes dodgy Monterrey scene, and why they decided singing in Spanish was cool after all. What's the Monterrey scene like? COCO: A few years ago we had a very big problem with drug dealers. There was a lot of kidnapping, a lot of killing, a lot of violence. People wouldn't even go out of their homes, so it's not like they were walking to the bar. There's not a show every week; there's a show like once in a month. ORLANDO: People are very paranoid. COCO: Two days ago, in Monterrey, we played our first show in our city this year. We played Festival NRMAL [in March], but that was like a festival; two days ago it was our first show, and it was so great. There was a lot of people and it was in a place that a few years ago was always full of people and music, but after the drug dealer problem, it was totally fucked up—like a closed neighborhood. Nobody was there. But right now, there's kind of a revival. How long have you guys been playing music together? ORLANDO: With this band, one year. We had another band before, Husky, for like, three years. COCO: Orlando was the drummer of Husky, and one day he asked me, “Hey, will you stay with me after the Husky rehearsal? I want to learn how to play guitar." And I was like, "Why not? Let's do it." We stayed at the end of rehearsal for three hours. In those three hours, we wrote three songs that are on our first album. We were like, dude, this is so crazy—we have to record this. Did you always have similar taste in music? COCO: Yeah. We were good friends before being in bands together. ORLANDO: I always wanted to try drum machines; I always really liked the sound of them. Everyday we'd message each other, like, "You need see these drum machines," or "Michael Jackson used this drum machine," stuff like that. Everyday, we were doing this research, and we made this database of the sounds we liked. It was crazy, because when we found [the gear] on eBay it took, like, three months until we could get it because they were lost. ORLANDO: One synth—that was made in 1985—was in Philadelphia, and it was a mess to get. COCO: We were calling the lady at UPS, like, “Please, I really want that synthesizer!" So are you guys influenced by American pop and indie rock? ORLANDO: Yeah, sure. Of course we like new bands and we like to take some things from them, but it's not stealing—it's the art of stealing. It's research. New bands inspire us, and older bands do, too—so it's a mix. We kind of like try to separate our ideas. But we actually started listening to a lot of Spanish bands, from Madrid—like Los Zombies and Ataque de Caspa. COCO: Most of the music we were hearing before was in English, and that was the first time that we heard that New Wave pop sound in Spanish. We were like, “This is awesome." I was talking to a Latin producer who said he strays away from sampling Spanish vocals because he thinks they sound corny. ORLANDO: For us, it was hard to sing in Spanish. For us it was cheesy, too. But when we listened to these bands—those Spanish bands—singing in Spanish was cool for us. COCO: A lot of Hispanic people or artists are big fans of an American or English or French band and they say, “I want to be the Hispanic version of that band." We wanted to break that paradigm. I think we are all people, and we can all make good things. ORLANDO: When we were in Husky, all our friends always told us, “You should sing in Spanish and you will see the difference." So this was our side project, this was nothing important. We thought, No one knows about this, I don't know what will happen with this, so if it's not cool, whatever; let's try it in Spanish and see what happens. We were so laidback. The funny thing is, it's like same story with other bands—from United States or from Europe or wherever—they try with all these different bands and then they do a side project with no expectations. Suddenly, that project is the thing that actually works.